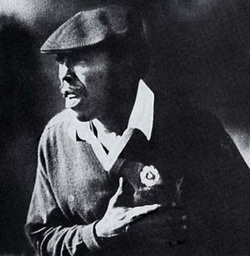 Unique among early black golfers, Calvin Peete did not enter golf by way of caddying. In fact, he did not even hit golf ball until age 23, an unusually late age for any future professional to begin a sport. One of nineteen children, he would become the greatest black golfer until Tiger Woods. Turning professional in 1971 he won his PGA card four years later. It took three seasons, but in 1978 he won his first victory in the Greater Milwaukee Open and was ranked 27th on the money list of professional golfers’ earnings. By 1981 he was ranked number one on the tour for driving accuracy and in greens in regulation (meaning ability to land his ball on the putting green in a timely manner). The next year he finished third in the PGA Championship, one of golf’s Grand Slam events. However, he was not actually a fully accredited member of the PGA because one prerequisite is having completed high school, which Peete had never done. Thus, in 1982, having studied with his wife who was a part-time teacher, he earned his GED and therefore the ability to compete on the Ryder Cup Team, an important American-European competition held every other year. In 1984 he won the Vardon Trophy for lowest scoring average and when he ended his PGA career in the late ’80s he was the most successful African-American player ever with 12 wins.